1:39 pm. OMG, is it hot or what? I walked up to the Kelso Rd water cache at noon thinking I'd just eat lunch then walk on. But, but, but it's too hot to climb (whining mightily). What to do? I still need 13 miles to break up the 46 mile section I need to accomplish but I am stymied by the thought of hiking, uphill, totally exposed to the sun and temps close to 90. I am a hot weather wimp! Just as I was contemplating my troubles (I know, first world troubles) Useitup came walking up, chipper and ready to go. Also to give me some news about Joaquin who is also struggling with the heat and a bad foot. Apparently they came up with a plan that I was invited to share in, which is to snag a ride to Lake Isabella, with a young man we had all met earlier who is day hiking with his dog. He agreed to take her to town today and I was invited to join in. We would share a room tonight, she'd take a bus to Bakersfield and rent a car, driving back to town, picking me up on the way to Walker Pass and dropping me off there and picking up Useitup, then driving home for a week. Their home sold and they have to go home and move out! Complicated but doable. If I do this then I will have allowed myself to be defeated once again by this section. I had high hopes I would go through when it was cooler but it appears not. When they say 90% of a successful thru hike is mental, they are 100% correct. I guess my mental capacity doesn't include hot weather hiking... At least not mid-day hiking. Even though it is desert-like here at the cache we were treated to a wonderful pine forest for the first half of the day and it was a treat to walk in that kind of soothing environment. 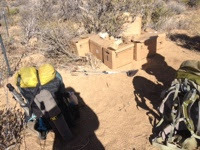 It is hard to come back into the desert after so many miles of slogging through it. Maybe this is what got me all tweaked about hiking this noon. Later... Isabella Motel. It took most of the day to get here but we finally got dropped off at 6 pm and got a room. I'm just plain tuckered out. Over and out. P.S. Joaquin and I have made a pact to come back next year, in early spring, to walk the missing miles. When it's cold!!! I hear ya about the heat. Last week zapped me big time. And I wasn't walking 15-20 miles per day! 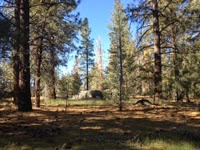 What a wonderful relief in Idyllwild today with temps in the 50's and 36 tonight. So do you have a desire/plan to rejoin TC and DG? Rest up my friend.